Calculate fuel savings using an Evinrude engine vs typical competing engines. The app is a linear experience where the user walks through various questions meant to provide the app with data regarding the user’s current outboard-engine maintenance costs. The last step then presents the potential costs savings if the user were to switch to an Evinrude E-TEC engine. 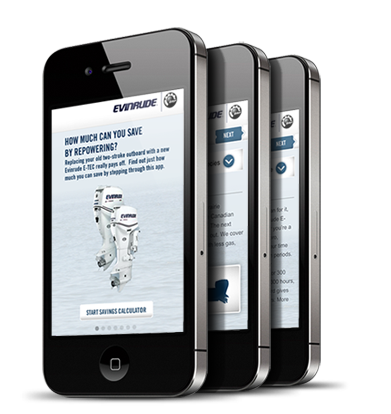 The Evinrude Repower Cost Calculator started life as Flash application hosted at Evinrude.com. Ideally the Flash app would of had some sort of documentation but that didn’t prove to be the case. In order to discover the various calculations involved it became necessary to reverse engineer the Flash application which was written in AS2. The mobile app was written using Sencha Touch 1 and used PhoneGap as the application wrapper.